Always looking for someone to piss off, Facebook recently redesigned their Fan Pages. These are primarily used by brand marketers to rope off their social homestead. Weird thing is that they basically just turned them into standard user pages, complete with tabbed sections and status posts. Kinda lazy if you ask me. From a user experience standpoint, it can be a bit confusing since the only thing differentiating it from a human page is the user name and profile photo. Go one step further, and you can create a fan page that looks/feels like an actual user. And you have 60 friends, er I mean fans. Who actually are his friends in real life. So that's even more confusing. 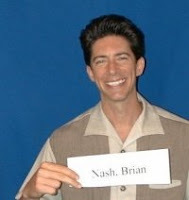 But if you didn't pay close attention, then you really would think it was Mr. Nash's personal page. The other brand/human blur affects status posts. Brands with fan pages can now send them, which show up in your status scroll along with all your friends' statuses (stati?). So whoever created the Mr. Nash fan page can send status posts to the fans, which show up as coming from Mr. Nash. The other side effect is that this actually opens up brand posts for users to comment on. Every fan can then view all the consumer feedback, I mean replies to that post. This may seem like a great way to get consumers engaged with your brand. Only problem is Facebook is large enough now to mirror the general Internet population. There are a lot of idiots out there. You are protected from ever coming into contact with them unless they are your Fbook Friend (in which case you already know they are idiots and have accepted it). Opening up the status comments to any "fan" will turn Facebook into an AOL chat room circa 1998. Or MySpace circa two days ago. They have 59,000 fans and their brand status posts are harmless self promotion. Each one gathers between 40 - 100 user comments, more than a few that must be causing the brand managers to sweat bullets and keep their PR agency on red alert. Take a peek at this one. A few negative user comments isn't the death of branded social media. But the other 58,900 consumers who are reading them? That is something to worry about. In the old Brand Fan Page Dimension, user comments were restricted to wall posts and were not broadcast across the site. Plus those were user-initiated, whereas now brands are almost baiting bored dumbasses to respond. The good news is that the community usually self-polices itself, even when the topic is shampoo that smells nice. Unfortunately now it is being done publicly on one of the most popular sites of the Interweb. Is there a cross promotion opportunity for Herbal Essence and Nash? In any event I agree that the facebook updates are really a step backwards.